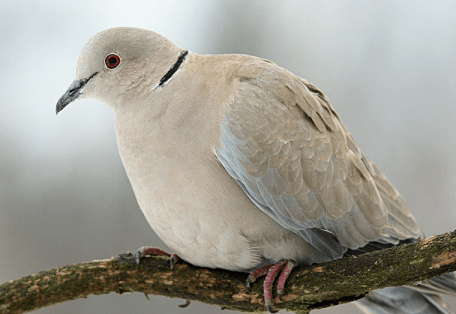 Eurasian collared dove (Streptopelia decaocto) complete detail – updated. Description of Eurasian collared dove (Camedi). Local name of Eurasian collared dove is Camedi. Classification of Eurasian collared dove (Streptopelia decaocto). This is one of the commonest doves of the plains, very plentiful in certain areas and rather inexplicably scarce in others. It loves open, cultivated—though essentially dry country, abounding in groves of trees within which to retire during the heat of the day. Thorny scrub, babul and dhak jungle make favorite roosting places. It is found abundantly in the neighborhood of human habitations and fearlessly enters villages and compounds…………. Habit and habitat of Eurasian collared dove (Streptopelia decaocto). Eurasian Collared-Doves reported in most parts of word. They live in urban and suburban areas. In rural settings look for them on farms and in livestock yards where grain is available. In cooler months, , flocks may roost together in large trees. Size of Eurasian Collared-Doves is between 22 cm to 30 cm including the tail. The Weight of adult is between 120 g. to 260 g. Their diet consists almost exclusively of seeds and grain. The adult male has buffy grey-brown upper parts, but the back is greyer. The flight feathers are darker brown. When the wing is closed, the fore edge appears bluish grey. The head shows pale grey forehead and crown, whereas nape and neck sides are more pinkish. At the rear of the head, at neck base, we can see a black half collar edged with white…………. 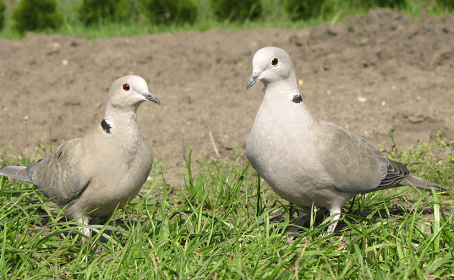 Eurasian Collared-Doves have plump bodies, small heads, and long tails. Size of Eurasian Collared-Doves is between 22 cm to 30 cm including the tail. The Weight of adult is between 120 g. to 260 g. They’re larger than Mourning Doves but slimmer and longer-tailed than a Rock Pigeon. 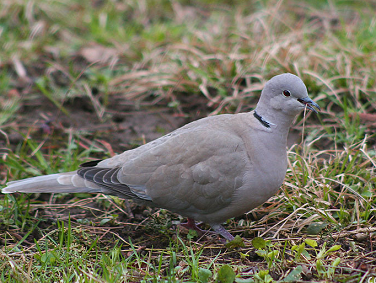 Eurasian Collared-Doves have a large, pale gray-buff dove with a black collar. There is also a naturally occurring cream-colored variant, and this species is known to hybridize with the ringed turtle-dove, so plumage variation will occur. The tail is fairly long and blunt-ended. The wings are broad and slightly rounded. Eurasian Collared-Doves are chalky light brown to gray-buff birds with broad white patches in the tail. The bird’s collar is a narrow black crescent around the nape of the neck. In flight and when perched. The adult male has buffy grey-brown upper parts, but the back is greyer. The flight feathers are darker brown. When the wing is closed, the fore edge appears bluish grey. The head shows pale grey forehead and crown, whereas nape and neck sides are more pinkish. At the rear of the head, at neck base, we can see a black half collar edged with white. The wingtips are darker than the rest of the wing. The undersides of the wings are pale. The underparts are a paler buff-gray merging into gray on the under tail coverts. A dark gray tail has obvious black at the base when seen from below; the black extends beyond the under tail coverts. This black includes the outer webs of the outer rectrices, and the tail has a broad, pale buff-gray terminal band. A reddish brown iris borders narrow grayish-white orbital skin. The blackish bill has gray at the base, and the feet are dull reddish. Eurasian Collared-Doves reported in most parts of word. Generally found in Asia, Bulgaria, Europe, Balkan, Germany, Great Britain, Ireland, Turkey east to southern China and south through India to Sri Lanka. Throughout the drier portions of the Indian Umpire, ascending seasonally and locally up to 10,000 ft. in the Himalayas. Two races are recognized viz., the India-Assam-Ceylon decaodo, and the Burma race xanthocyla. Its original ranges are India, Sri Lanka and Myanmar, and also some parts of Asia. Towards the half of the 20th century, the species extended to the rest of Europe, including into the northern part. It was introduced in the Bahamas into the 1970s and in Florida in the 1980s. Since this period, it gradually colonizes the North American continent. Eurasian Collared doves typically breed close to human habitation wherever food resources are abundant and there are trees for nesting. 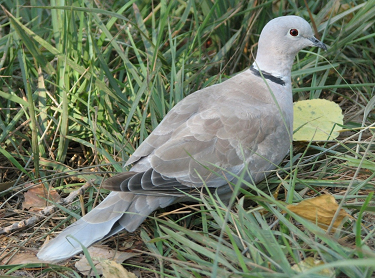 Eurasian Collared-Doves live in urban and suburban areas. In rural settings look for them on farms and in livestock yards where grain is available. In cooler months, flocks may roost together in large trees. This is one of the commonest doves of the plains, very plentiful in certain areas and rather inexplicably scarce in others. It loves open, cultivated—though essentially dry country, abounding in groves of trees within which to retire during the heat of the day. Thorny scrub, babul and dhak jungle make favorite roosting places. It is found abundantly in the neighborhood of human habitations and fearlessly enters villages and compounds. Their diet consists almost exclusively of seeds and grain. This bird is mainly a grain-eater, taking all kinds of seeds from wild or cultivated plants, but also fruits and berries. It also catches some insects and invertebrates. Nesting, practically all the year. Scanty twig nest in bush or small tree. The construction of the nest, even hard, does not lead to an artwork, but rather to a small loose platform made with some coarsely woven twigs, from where the eggs often fall. The nest is usually in tree, shrub, against the trunk, not always well hidden. Their strong flight pattern features bursts of clipped wing beats and looping glides. At the time of walking, these doves bob their heads and flick their tails. 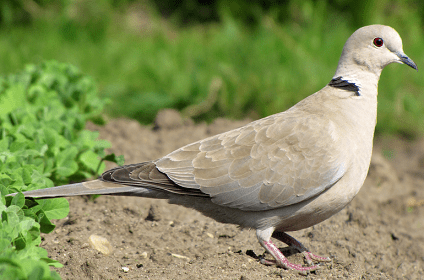 Eurasian Collared-Doves often feed at backyard seed feeders and on spilled grain in stockyards and around silos. Breeding occurs throughout the year when abundant food is available. 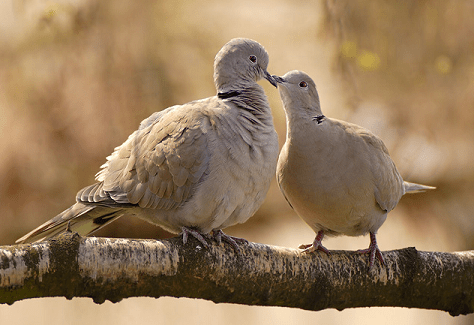 The Eurasian Collared-Dove breeds several times per year, and in temperate areas, the breeding season almost lasts all the year. Generally, the female lays two white color eggs in their nest, female incubates during the night and which the male incubates during the day. Incubation lasts between 13 and 19 days. Breeding males indulge in a pretty aerial courtship display, rising vertically into the air on noisily flapping wings and fanned-out tail for about 50 ft., and descending in a graceful spiral glide uttering an aggressive-sounding, prolonged koon-koon.